I spend most of my ski days in the Wasatch backcountry. I love all types of skiing, from lapping powder to technical chuting. I ski solo a lot of the time and probably should get more partners. Look me up if you're interested. I'm fortunate enough to have several setups and access to even more. 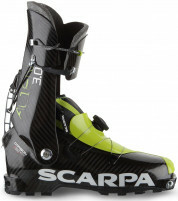 I've been using the Ski Trab Magico with Gara Titan Release bindings a ton. Often with Sportiva Syborg or Fischer Travers Carbon boots. I also ski a lot on the Movement Response-X 177 w/ Kreuzspitze SCTT bindings. Really loved the Hagan Y-Flows but those are now my favorite rock skis. Hi Andrew, dang pollen! It sounds like maybe your glue has "gone off". That can happen with exposure to excess heat or sunlight. The iron trick might work, though you may need a re-glue at this point. Hi Pete, fyi the patterns are listed here.